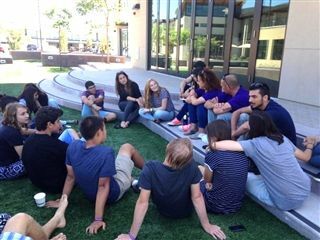 This July, a group of Pacific Ridge students joined teenagers from Israel, Palestine, and the United States for a 17-day program of cross-cultural dialogue and peace building. The program, put on by interfaith coexistence organization Hands of Peace and coordinated by history teacher and Hands of Peace site director Scott Silk, was hosted on-campus last summer as well. Hands of Peace helps build bridges between teens divided by conflict, culture, geography, and history. Through team building, group-bonding experiences and dialogue sessions, participants were able to explore their identity and worldview and come to understand each other in a larger context.